Smallseed Sandmat is a member of the Spurge Family. The perennial herb grows in a clustered mound to 4 inches in height and has small grayish-green, elliptical leaves. 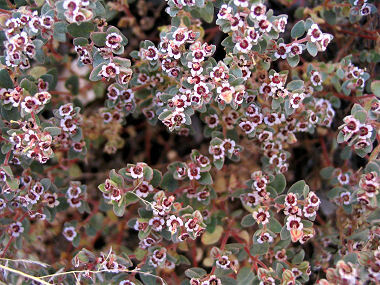 The plant typically grows on dry slopes, washes, and sandy places at elevations below 3000 feet. Smallseed Sandmat is also known as Small Seeded Spurge. Smallseed Sandmat blooms throughout the year and produces tiny flowers with 4 petals, each with a red to black gland at their base.